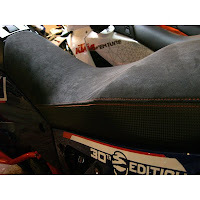 KTMtwins.com KTM Motorcycle and Product News: KTM 990 Adventure 20TH Anniversary Suede Seat is now in stock! KTM 990 Adventure 20TH Anniversary Suede Seat is now in stock! We just received our first shipment of the anticipated KTM 990 Adventure 20TH Anniversary Suede Seat and we are excited to tell you there are a few left in stock. Come and get um! New items coming from KTM!